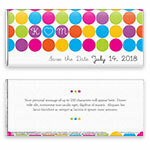 This bright and cheerful wrapper design will bring an elegant touch of fun to any celebration. Design: Bright coloured polka dots with initials. Personalization: Front initials, event and date, and back message.